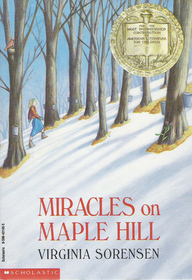 Miracles on Maple Hill was published in 1956, and it was the winner of the 1957 Newbery Medal. As the book opens, Marly and her family are headed to Maple Hill, a rural area of Pennsylvania where Marly’s mother spent her childhood summers. Though at first it appears to be a happy family vacation, the truth is that Marly’s father is suffering the psychological effects of the time he spent as a prisoner of war. At home in the city, he is angry and irritable, jumping at every little thing and sometimes even mistreating his children. The family is coming to Maple Hill in the hopes that the country lifestyle will help Marly’s dad start to heal. Over the next year, Marly gets to know wonderful people - Mr. and Mrs. Chris, Harry the Hermit, and Margie - and she experiences all the miracles Maple Hill can offer, from maple syrup and wildflowers to the slow recovery of her father’s mental strength. In contemporary children’s books, there is a tendency to dwell more heavily on the darker side of life. Nowadays, for better or for worse, we trust kids to deal with the harsh truths of life - abuse, poverty, divorce, death - and many books describe these situations in detail, evoking empathy from readers and encouraging them to feel all the associated emotions, good and bad. This book handles the pain of Marly’s dad’s experiences in a more detached way, which I think is an interesting and effective approach. Marly is about ten years old, and what we know of her dad’s condition is filtered through her point of view. It seems likely, given the personality of her mother, that Marly would be protected as much as possible from the darkness of her father’s experiences. Because of this, the reader is really only shown those few frightening moments of anger that Marly has actually witnessed. Throughout the book, both Marly and her brother react to their father nervously, with lots of concern over how he will respond to them, but the reader isn’t subjected to the experiences that made them feel that way. I can only assume this was a conscious decision on the part of the author, and my guess is that it was a decision made to protect young readers. Though some kids do certainly like to read the gory details, or maybe even need to read them to feel validated, other kids are more sheltered, like I was, and this book strikes a great compromise between perfect happiness and interesting storytelling. The other remarkable thing about this book is its descriptions of country living. I borrowed this book from my urban library system, where kids don’t often run into wildflowers, wild mushrooms, or sap from maple trees. If they read this book, though, they will feel as though they have spent a year on Maple Hill right alongside Marly. The descriptions of everything Marly sees, feels, and tastes during her year of visits to Maple Hill are beautiful, and the author uses just the right details to transport the reader through the beauty of the different seasons. She ties all of this wonderful information about the natural world in with Marly’s relationship with her brother, Joe, and both kids’ relationships to their Maple Hill neighbors, and it is the combination of character and setting that drives the story forward. This is very much of a book of the 1950s. There are lots of references to very rigidly defined gender roles, where Joe is permitted many freedoms, but Marly must stick close to home, and where it is surprising when Marly’s father learns to cook, or when her mother drives the family car. At one point, Marly’s mother actually apologizes to Marly’s teacher because Marly is more of a tomboy than the other girls at her one-room schoolhouse. These references are among the few moments in the story that make it seem more historical than contemporary. There are also a lot of references to Marly’s father’s time in World War II, which could date the book, but given that our country is also at war today, it is possible that contemporary kids could have a parent in a similar situation to Marly’s father and find some hope and meaning in his recovery. I really enjoyed this book, though it’s probably best enjoyed when we think of it as “old” realistic fiction rather than historical fiction. The story reflects the values of the time, but they have not been filtered through contemporary thinking. Two very recent novels about similar subjects that might draw interesting comparisons are The Second Life of Abigail Walker by Frances O’Roark Dowell and The Bell Bandit by Jacqueline Davies.